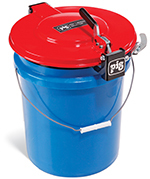 New Pig introduces the PIG 5-Gallon Latching Pail Lid, which is the first latching lid designed to fit both steel and poly 5-gallon pails. The durable, powder-coated steel lid opens and closes with a single latching hasp. A reinforced hinge, latching mechanism and nitrile gasket create a tight seal around the lid, helping to keep pail contents pure and decrease vapor emissions. In addition, a fast-latch ring makes installation easy. 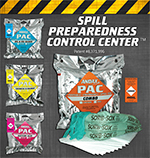 Andax Industries LLC’s color-coded Spill Preparedness Control Center™ (SPCC) ensures the correct Spill Pac will be used every time. This system consists of four Spill Pacs with unique color-coded labeling with matching color-coded equipment labels. Potential leak sources can be identified by placing labels on equipment before a spill or leak occurs. In the event of a spill, just grab the matching color-coded Pac for the equipment label to have the exact sorbents and pads needed to contain and clean up the spill or leak. 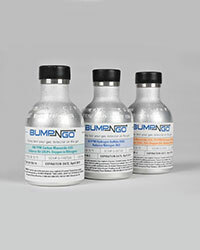 The SPCC System™ includes four vacuum-packed Spill Pacs: orange Combo Pac™, yellow Chemical & Hazmat Pac™, blue Oil & Oil-Based Pac™ and the pink Battery Pac™. 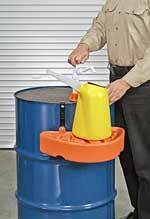 Each contains or cleans up to a 10-gallon spill. Parker Hannifin Corporation is now showcasing its PF Series non-spill thermoplastic chemical transfer couplings. These dry disconnect quick couplings eliminate fluid loss upon disconnection for minimal environmental contamination. Designed to meet requirements for closed system transfer of chemicals and other fluids, Parker PF Series couplings can be used with concentrated or diluted industrial chemicals, fertilizers, herbicides, insecticides, fungicides, or pesticides when transferring from bulk storage tanks, returnable containers, applicators, and more. Applications include chemical dispensing systems, agriculture spray application equipment, intermediate bulk containers (IBCs), pulp and paper, sulfuric acid PH stabilization, industrial chemical transfer and water systems. NLB Corp’s new 3D water jet head, The Torrent 200, combines high flow with high horsepower to increase the efficiency of tank, tote and reactor cleaning. It is rated at up to 200 gpm (757 lpm) and 2,300 hp (1,715 kW). The Torrent 200 rotates horizontally while two high-velocity water jets spin vertically, driven by the flow of high-pressure water (20,000 psi, or 1,400 bar). This 3D action produces complete 360 degree coverage of the interior walls, not only reducing cleaning time but automating a process that previously required personnel to enter a tank and be exposed to risk. The PIG® Burpless® One-Hand Sealable Funnel from New Pig Corp. features a low-profile, vented funnel that is designed to seal with one hand in order to help users meet closed-container regulations. Its patented Burpless design prevents pressure buildup, allowing quick and continuous flow with no splashback. 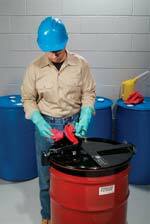 The PIG® Vapor-Control Latching Drum Lid from New Pig Corp. features a hinged, lockable drum lid with a built-in, five-foot-long port that is designed to provide easy and secure access to materials stored in a 55-gallon, open-head steel drum. The new GT Multi-pump Dispensing System is Westcott Distribution Inc.'s latest pumping solution for spill-free, environmentally safe transfer of any chemical or liquid. The system is designed to expand capability and streamline operations where multiple liquids are needed. The pumps meet RoHS and FDA safe food requirements and are made in America. 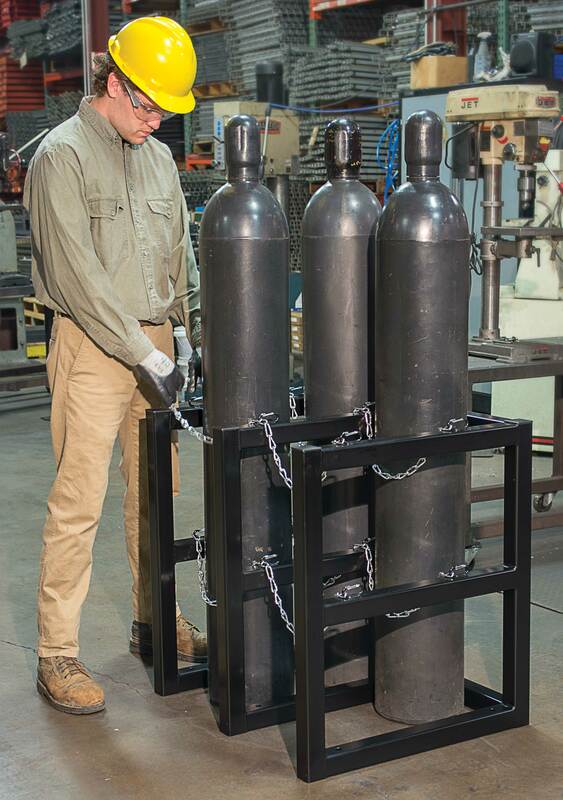 New Pig's PIG® Drum Filling Shelf is designed to help transfer fluids easily and safely from storage drums by allowing the user to position fluid-dispensing containers in close proximity to drum pumps,reducing risks of spills and drips. Adjustable steel-strap brackets can accommodate several container sizes, weights, and configurations.